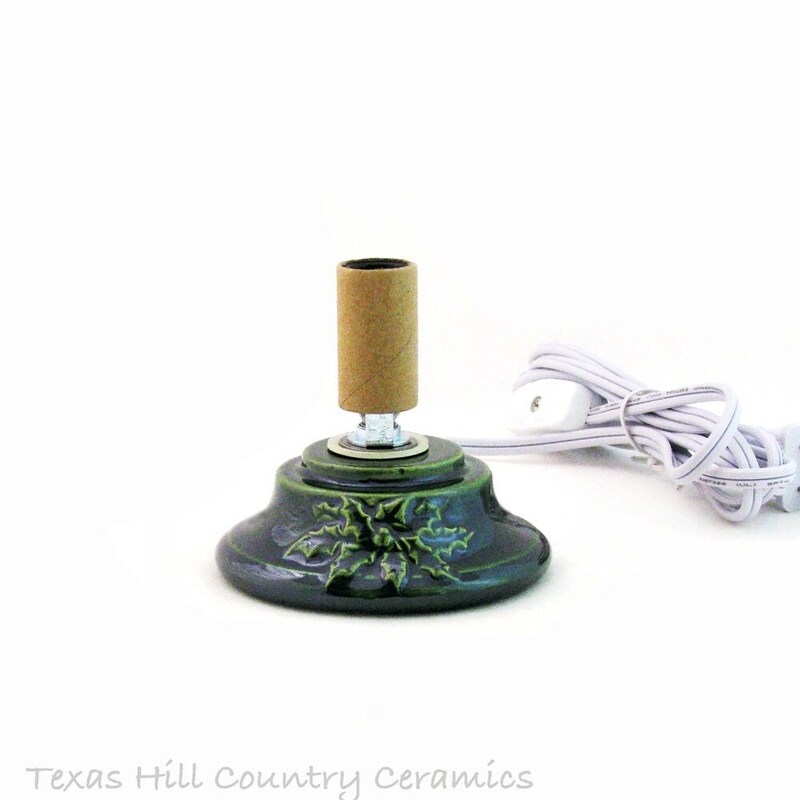 This small electric replacement base or stand can be used to replace a lost or broken base for an existing mini or little ceramic Christmas tree. This base has a holly embossed design on the front and is available in green or soft white. Currently this base is made to order and ships on completion. The style of the base is slightly flared with an embossed holly design on the front. 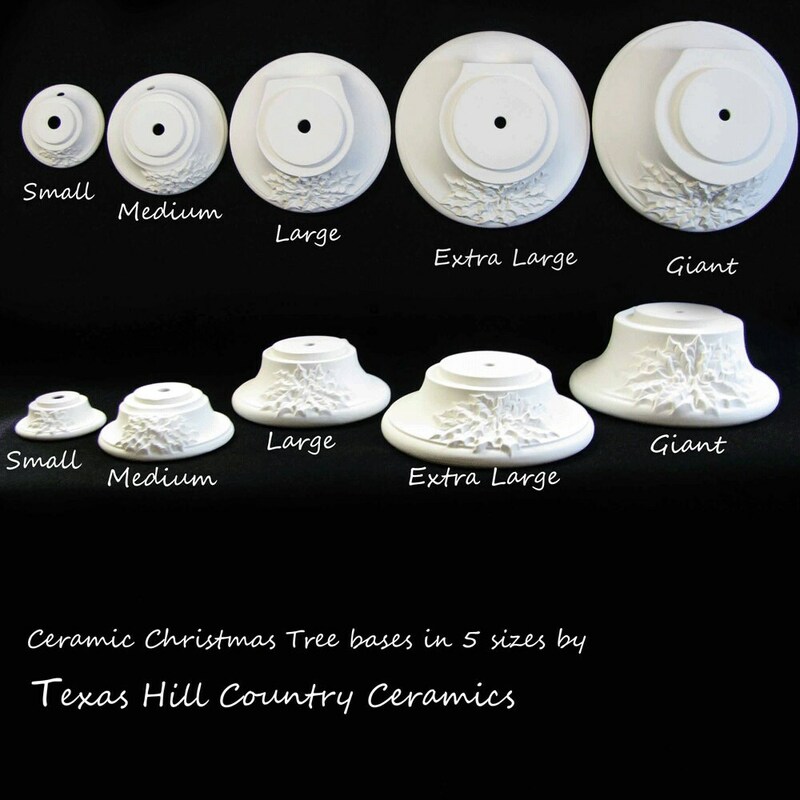 This ceramic base fits smaller mini size ceramic Christmas trees that have an opening in the bottom of the tree that is between 1 5/8 inches to slightly less than 2 1/8 inches in diameter. Normally the height of the tree section this base fits is about 6 inches tall. 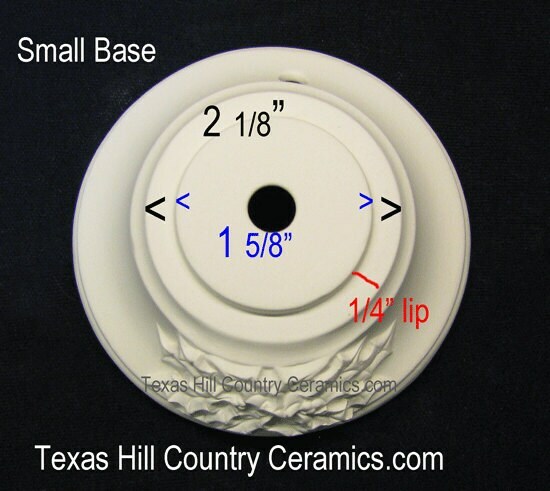 Please refer to the photo of the base with the exact measurements of the top. 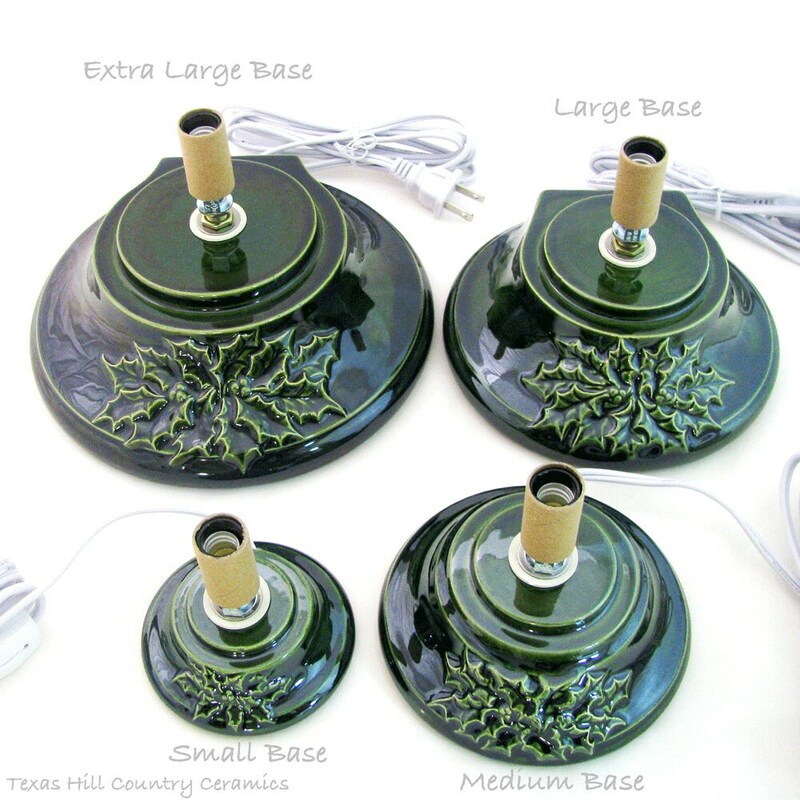 The base is hand wired with a permanent UL approved candelabra light fixture, the cord is white. There is an inline dial-style switch on the 6 ft cord, so you can leave it plugged in and switch your tree on whenever you want. 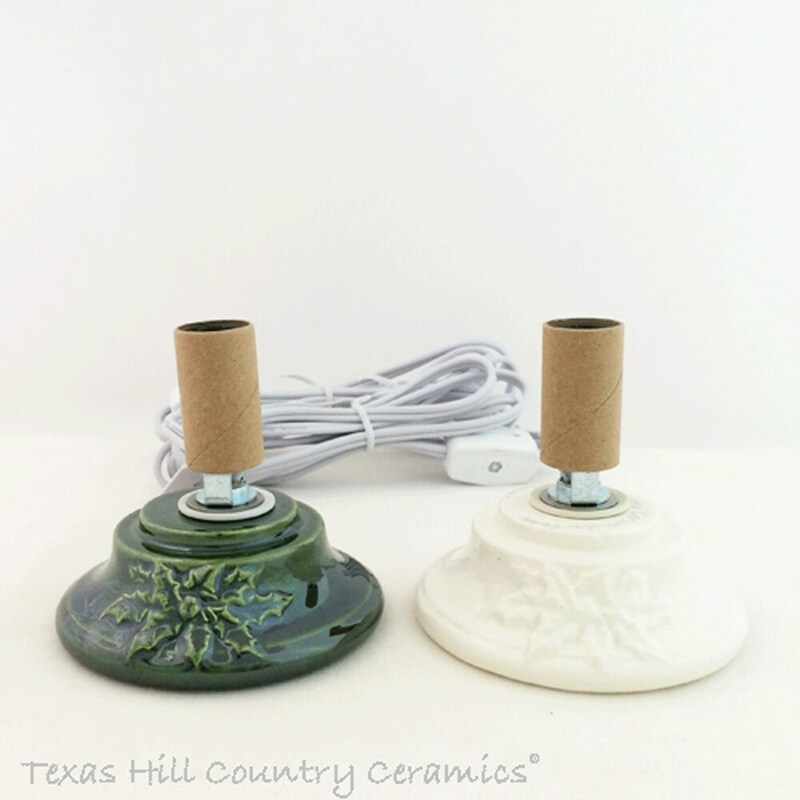 The glaze used on the bases is a lead free gloss glaze, the green glaze is evergreen and the white glaze is milk glass white. The small replacement base will arrive ready to use including the light bulb. Use a 7 1/2 watt bulb with this size tree. The replacement ceramic tree base was exactly what I needed after the original broke while decorating for Christmas. And got it in time to use this holiday! The base was just what I was looking for and the seller was a pleasure to work with. There was a mix-up with the color, and she responded right away and made the exchange within a matter of days even though it was right around Christmas! Awesomeness all around.